Do you like unique accessories? Ms Formaldehyde specializes in hand crafted Polynesian, tiki, spooky and cute accessories. I was able to look through her Etsy shop and choose something to review. I had a hard time picking something. 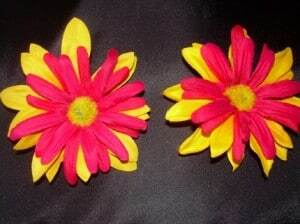 I eventually choose the fun pink and yellow daisy clips. My girls love them! I love them. I never wear things in my hair other than a pony tail elastic but I would consider wearing this. Kelly has several styles of clips and hair sticks to choose from. 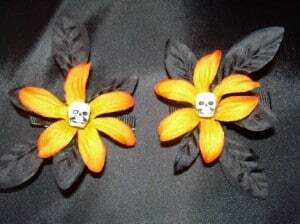 I loved the Red Plumeria hair sticks and for Halloween she has a lot of skull ones. Kelly has a Facebook fan page that she holds a monthly drawing for. When you like her page you are automatically entered into the drawing. Her son is also undergoing radiation so the proceeds from her website are going to a mom with a lot of medical bills. I understand her pain; according to our local hospital my son is currently valued at over $1.5 million dollars. Kelly’s items are great quality and hand made and she has something for everyone at affordable prices. Halloween spooky skull BOO bows are cute. I checked out her facebook page (and her Etsy page)! I like the Pink skull earrings! I like the black glitter earrings!